There are a lot of brands out there with generic names. Many of them do just fine. But when your name stands out, communicates your unique benefits and engages your employees and customers, that’s an advantage too powerful to ignore. We specialize in developing inspiring names for sustainable businesses, products and programs. Scroll down to learn more about our naming process. Better yet, send an email if you want to drop a name project on us. Naming a technology company is a challenge. Complex benefits to communicate, varied stakeholders and the need to create a unique identity in a competitive global landscape. 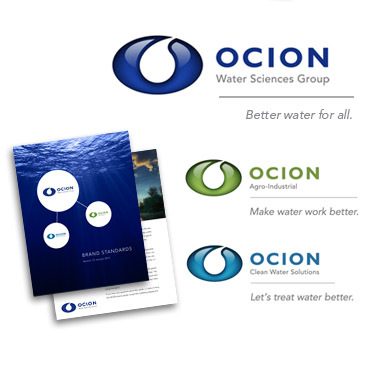 Originally called EnvirEau Technologies, this Richmond, BC company wanted a re-brand that would help launch their ion-based water purification and fortification systems worldwide. 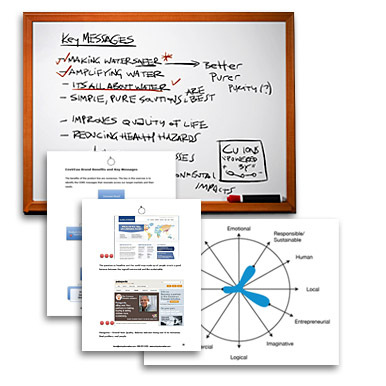 We began with a Brand Centering™ session to look at context, opportunities and key messages. 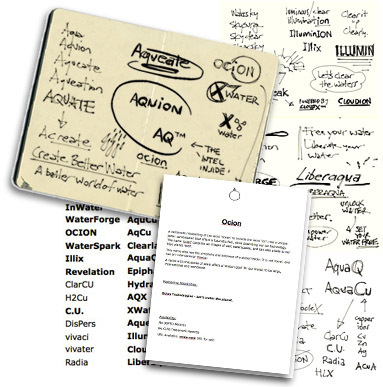 We then opened up the creative funnel, considering hundreds of name and positioning possibilities, cross-referencing them with our brand research and scanning trademark resources to eliminate the many great options already in use. At this stage we consider imaginitive names, conjoined words, technical prefixes and suffixes and invented names. Getting the list down to three contenders or less, we began to explore some graphic expressions of the identity. 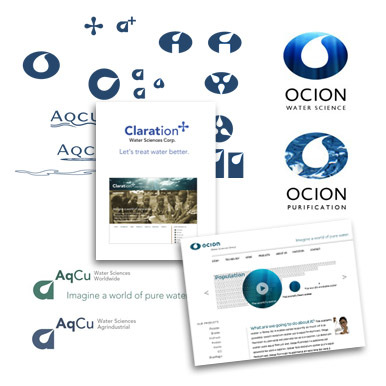 OCION quickly rose to the surface for several reasons: It sounds global, it is all about water, it incorporates the ‘ion’ of the proprietary technology and the .com web address was available. Most important, there were no other companies using this name that we could discover. The resulting name and logo is bold and iconic. The tagline ‘Better water for all’ describes the company’s mission at the highest level. Expanding the brand family to include other divisions of the company was done using colour and a modification of the tagline.